As anyone who’s heard me speak knows, I don’t get overtly “radically” about it. But I’ve been at this long enough now that I do see patterns. And the patterns teach me that the way people see things now may not be how we’ll see them in the future … and it’s up to us all to speak the truth as we see it. In 1873, suffragist Susan B. Anthony was found guilty by a judge in Canandaigua, N.Y., of breaking the law by casting a vote in the 1872 presidential election. She was not convicted by a true jury of her peers, because women cannot serve on juries. Her conviction did not come after secret deliberations by an unbiased jury because Judge Ward Hunt, after hearing the evidence, directed the jurors to find her guilty. Even a defense motion to poll the jurors individually after they delivered their verdict was denied. All of this may sound familiar to patients whose opinions are considered not worth hearing because, after all, they’re only patients, so what could they know? These things take time. Unless they don’t. 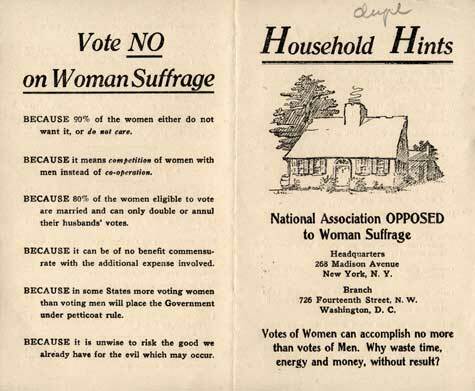 On election day in 2012 in the Atlantic, Eleanor Barkhorn wrote about a fabulous flyer from that era that I’ve used in many talks. It can be of no benefit commensurate with the expense involved. You do not need a ballot to clean out your sink spout. Sulpho naphthol and elbow grease drive out bugs quicker than political hot air. There is no method known by which mud-stained reputations may be cleaned after bitter political campaigns. For more laughs, I dare you to read the whole flyer. And that was years after Anthony’s death in 1906. Is it any wonder that in her later years she looked a bit bitter, after decades of making her case and getting responses like that? The work is not done when things are better for you. Thanks to friend Marge Benham-Hutchins for pointing out the photo above, of one episode in the women’s movement where push truly came to shove. 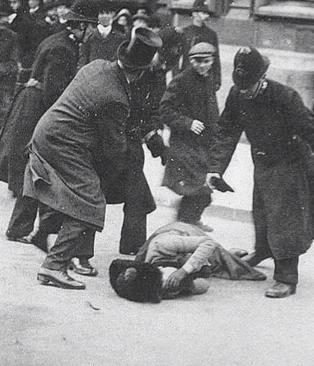 As far as I can tell from Google, it’s a photo of an English suffragette being beaten on Black Friday, Nov. 18, 1910 — right around the time when the flyer above was printed. More than 30 additional years after Anthony’s conviction. 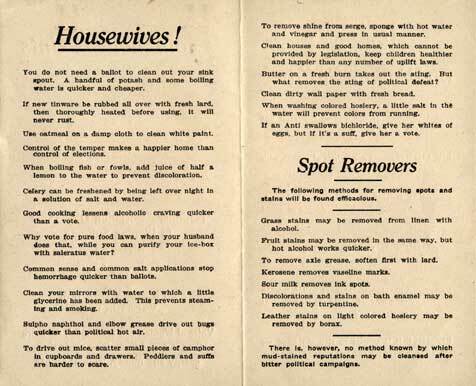 Ten years later, according to Wikipedia, some UK women got the vote: “From 1918-1928, women could vote at 30 with property qualifications or as graduates of UK universities, while men could vote at 21 with no qualification.” In 1928 the age restriction was removed. In Switzerland the last region gave women the vote in 1991, and during my 2013 visit a TV news item in Lucern said “a woman driver” caused an accident on the motorway. That’s such an ignorant thing to say; in my testimony in Washington in 2011 I pointed out that insurance statistics show women have 1/3 fewer accidents than the men who used to make fun of them. But power politics still apply in medicine: Enormous amounts of money are in play. So those who believe in the rightness of patient power will have to speak up — and perhaps fight — for a long time before the last “patient suppressor” is gone. P.S. I hope this post will be of value to young women who don’t consider themselves feminists. Consider what life was like just one century ago. You still don’t legally have equal rights, but many people fought for the liberties you’ve gained so far. Dave deBronkart, also known as e-Patient Dave, blogs at e-Patients.net and his self-titled site, e-Patient Dave. He is the author of Laugh, Sing, and Eat Like a Pig: How an Empowered Patient Beat Stage IV Cancer and Let Patients Help!